We are so happy to announce that Joanne Rocklin's gorgeous picture book text, I SAY A SHEHECHYANU, has found a just-right home with Joni Sussman at Kar-Ben Publishing! I SAY A SHEHECHYANU introduces the concept of the Jewish blessing for beginnings, first times, and happy arrivals and gives examples of how a child might use this blessing through the year to take note of all kinds of newness and growth, large and small. Joanne is certainly no stranger to publishing Judaic books; her STRUDEL STORIES, for example, was an SLJ Book of the Year, and THE VERY BEST HANUKKAH GIFT was named one of the Best Hanukkah Books for Children by The Sydney Taylor Book Award Committee of the Association of Jewish Libraries. Star #2 for Pat Zietlow Miller! Debut author Miller takes the idea of playing with one's food to another level in this sensitive but funny story about a girl's affection for a squash. When Sophie selects a butternut squash at the farmer's market, her parents assume they will be having it for dinner. Sophie, however, quashes that plan by adopting the vegetable as her new best friend and naming her Bernice ("It was just the right size to hold in her arms.... Just the right size to love"). Despite gentle prodding to relinquish Bernice before she rots, Sophie brings her deteriorating pal to the library and somersaults with her in the yard. Miller's easygoing storytelling taps into the familiar scenario of children making fierce attachments to favorite objects; Sophie is passionate without being bratty, her parents are pragmatic but not harsh, and Sophie eventually makes new friends, including Bernice's offspring. Wilsdorf's (Five Funny Bunnies) winsome ink-and-watercolor scenes adeptly capture both Sophie's many moods ("Don't listen, Bernice!" she scowls when her mother suggests baking the squash with marshmallows) and her unruly pigtails. Ages 3–7. Thank you so much to all of our very talented clients for getting us to an agency record: Seven deals in seven days! STARS author Mary Lyn Ray's picture book text GOOD NIGHT, GOOD DOG, in which a sleepy dog tries very hard to stay awake, to Ann Rider at Houghton Mifflin Harcourt Children's, by Erin Murphy of Erin Murphy Literary Agency (world). Mary Lyn's BOOM! BIG, BIG THUNDER AND ONE SMALL DOG debuts next month, and A LUCKY AUTHOR HAS A DOG is coming in a future season, so we're very happy to complete the doggy trifecta with this new text--and we're sure her dog, Biscuit, is happy, too. We were so happy in April when the news broke that our clients Jennifer Ziegler and Chris Barton had tied the knot--and gosh, is that an understatement! It was a lovefest! Now we have even more happy nuptial-related news for Jenny--no, she hasn't gotten married AGAIN, don't be silly! But a wedding figures prominently in her new book, just announced! REVENGE OF THE FLOWER GIRLS features triplet sisters who pull out all the stops to foil their big sis's upcoming wedding so she can reunite with the guy they're sure she's meant to be with. It's scheduled to publish in 2014 with Scholastic Press, with Erin Black editing. The book will feature Jenny's trademark comedy, of course, and should delight tweens everywhere. Two New Books for Lindsay Smith! You may not have heard too much about Lindsay Smith's forthcoming releases, because they were sold pre-EMLA. Let that not deter you from your enthusiasm! Lindsay's stunning debut SEKRET is due out from Roaring Brook in winter 2014, and its sequel, SKANDAL, will follow in winter 2015. But if all that wasn't enough, Lindsay's got still more great things cooking! Yes, in addition to all of that—and with her first book still almost a year from publication—Lindsay has a brand new TWO-BOOK deal. Pitched as Graceling meets Inception, DREAMSTRIDER is the story of Livia, a seventeen-year-old with the ability to inhabit other people's dreams—a talent which she puts to use as a spy in the service of her country. But with the threat of all-out war looming, and the dreamworld growing more unstable by the day, will Livia's talents be enough to save her world—or even her own life? DREAMSTRIDER and its untitled companion were sold once again to Katherine Jacobs at Roaring Brook press, and the first book will publish in Fall 2015. Congrats, Lindsay! Once upon a time, there were some fairytale characters--no, not Goldilocks, not Hansel and Gretel, not those three billy goats; I'm talking about the Big Bad Wolf, the witch, the troll...what's the story with these guys, anyway? In Deborah Underwood's rich imagination, they gather at night to swap stories, share sympathies, and tuck each other into bed until it's time to make mischief another day—as we shall soon see, in her latest picture book text to find a home, GOODNIGHT, BADDIES! This delightful text was signed by Andrea Welch at Beach Lane Books and will be illustrated by Juli Kangas for a spring 2016 release. It will be Deborah's first book with Beach Lane or Simon & Schuster. Are human beings like separate particles floating through space and time, or are we all connected, revolving around each other, attracting and repelling, coming together to make something bigger? These are the quiet questions underlying the stories of the many characters in PARTICLES, Lindsey Lane's YA novel, told in multiple viewpoints and set in and around a remote pull-out on a rural Texas highway. Before the novel's opening, a high-school boy, a science genius without many friends, disappeared from this very place. He happens to have been obsessed with particle physics. The story that unfolds is in turns delicate, horrifying, heart-rending, thought-provoking...and altogether gorgeous. It definitely connected with the wonderful Joy Peskin, editorial director of Farrar, Straus, and Giroux Books for Young Readers. She made a preemptive offer on PARTICLES just a few days after it went out on submission—and we were very happy to accept! Joy has slated the project for a fall 2014 release. PARTICLES—or whatever it ends up being titled—will be Lindsey's debut YA novel. Just about three months ago, we were here celebrating a debut, two-book picture book deal for Maria Gianferrari, launching the spectacularly untalented Penelope and her dog, Jelly (forthcoming Fall 2014 from Houghton!). But while Maria's first sale was for fiction, it's only one of her many talents—and another thing at which Maria is spectacularly talented is crafting non-fiction. Which brings us to COYOTE MOON, a lyrical picture book that follows a suburban coyote's hunting trek across one dark moonlit night. This is gorgeous writing, folks, and a powerful story! And I'm thrilled to say that I was not the only one to think so: this week, COYOTE MOON was acquired by Emily Feinberg at Roaring Brook Press, to be published in 2015. Laurie Thompson Is On a Roll! Yes, she's a busy and multi-talented lady, that Laurie Thompson! Her first book was acquired last summer by Schwartz & Wade, a picture book biography of Emmanuel Ofosu Yeboah, which is being illustrated by Sean Qualls. Then just a few months ago saw a second deal for a teen handbook of social entrepreneurship, which is due out from Beyond Words/Simon Pulse in Fall 2014, and which Laurie is busily writing and researching as we speak. But that's not at all! This week I am thrilled to announce a brand new deal, for Laurie Thompson's adorable picture book MY DOG IS THE BEST: a little boy's effusive praise of his best friend and all the amazing feats that dog can do (while sleeping on the couch). It's sweet and warm and guaranteed to make you smile. Even better, an illustrator has already been attached to the project, the talented Paul Schmid! MY DOG IS THE BEST was acquired by Janine O'Malley at FSG, and it's going to make a giant picture book splash for sure. Huge congratulations, Laurie! It's certainly been a busy few months for Jennifer A. Nielsen, between travel and book events to launch THE RUNAWAY KING, finishing writing book #3 in The Ascendance Trilogy (coming spring 2014! ), and enjoying multiple weeks as a New York Times Bestselling Author. But if all that weren't enough, there is now yet another honor added to the mix. This last weekend was the Whitney Awards gala, where THE FALSE PRINCE received the award in the inaugural "Best Middle Grade Novel" category. But wait—there's more! Another prize was awarded for "Best Youth Novel Overall," and the honor went to... THE FALSE PRINCE, as well. A Star from Kirkus for Pat Zietlow Miller's SOPHIE'S SQUASH! Miller's debut, in which a little girl affectionately adopts a butternut squash, is a winner. After her parents buy that squash for dinner at the farmers' market, Sophie commandeers it, giving it a face with markers. It proves just the right size to hold, bounce on her knee and love. "I call her Bernice," Sophie says. "I'll call for a pizza," says her mother. 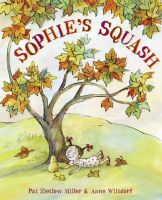 Throughout the fall, Sophie coddles her veggie, attending library storytimes, visiting other squash at the farmers market and practicing somersaults near the garden. Her parents do their gentle best to suggest alternatives for the moldering squash, from a trip to the toy store to a donation to the food pantry. Sophie will have none of it. "Bernice will last forever." When even Sophie notices changes in Bernice, she asks a farmer what keeps a squash healthy. Her unique interpretation of his advice ("Fresh air. Good, clean dirt. A little love") yields, next spring and summer, delightful twin surprises. Wilsdorf's amusing ink-and-watercolor illustrations alternate between full-bleed spreads and spots. From her bouncy braids to her red shoes, Sophie's vibrant, determined nature shines forth charmingly. Back in 2011, as a brand-new agent, I was hankering for a re-imagining of Daphne du Maurier's REBECCA, when Jenny queried EMLA with a story that was so good, so shiver-inducing, I had to ask her, "Did you use REBECCA to inspire this?" Jenny replied yes and I did not rest until I had signed both Jenny and her incredible story. Jenny McKissack's SANCTUARY, pitched as a "new du Maurier's Rebecca" about a girl returning to her family's island off the coast of Maine in pre-war 1939 to discover what really happened that awful, distant summer when a deadly fire killed her sister, has sold to Lisa Sandell at Scholastic, for publication in Summer 2015. It's delicious and creepy, a love story that will make you swoon, and a mystery that will keep you on the edge of your seat! Well hello, May! It's nice to see you! We've got a whole passel of books coming out this month at EMLA—all by the same author! Debuting late this month is Ruth McNally Barshaw's THE SHOW MUST GO ON, the fifth installment in the series published by Bloomsbury featuring the indomitable Ellie—and at the same time, the whole series is being repackaged and re-launched as THE ELLIE MCDOODLE DIARIES! In the new book, Ellie helps her class to stage THE WIZARD OF OZ. We wish all things Ellie McDoodle straight into readers' hearts!